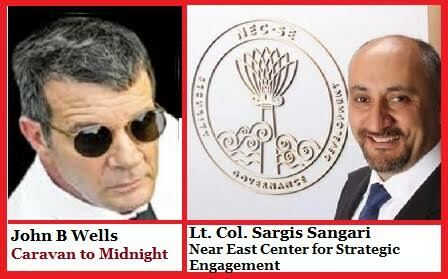 On 22 JAN 19 LTC Sargis Sangari, CEO NEC-SE, was interviewed on Caravan to Midnight by John B. Wells. The discussion covered Syrian withdrawal, Chinas and U.S. global fight, Russian “collusion”, the Italian Mafia, Cartel, and ISIS triad operations and their affects on the southern border, the 116 Congress political topics and issues and how they undermine U.S. foreign policy, North Korea playing China and U.S. against each other, Iranian sanctions, Turkey and Saudi fighting within the region, the use of the Caravans in South America as a possible weapon system to influence U.S. constitutional structures, Israels foreign policies and how what worked in the 40’s is now hindering its ability to secure itself in the long run, immigration issues and topics and much more.